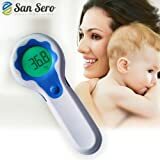 # 1 Digital Baby Thermometer - With LIFETIME GUARANTEE: Using Non-Contact Infra Red (IR) Technology giving you instant and accurate temperature readings - Protect your BABY from FEVER and ILLNESS by using the DUAL Colour Digital Display and AUDIO ALA (UPC 820103765695) is sold at the following online stores. We've find the latest prices so you can compare prices and save money when making your purchases online. Please click on the links below to browse to each store's webpage.